Startups serving the financial services industry face a unique set of challenges. For one, financial data is difficult to access and expensive when you can get it at all. Yet entrepreneurs need it to build robust, market-ready solutions. Long sales cycles, due to the requirements of purchasing, compliance, cybersecurity, and risk management at incumbent firms, also make it hard for FinTech startups to gain traction. Entrepreneurs report that the financial services enterprise sales cycle can take up to two years, if not longer. FinTech Sandbox and MassChallenge FinTech have joined forces to break down these significant barriers to financial services innovation. MassChallenge FinTech, the newest extension of the successful MassChallenge accelerator, is focused on the needs of FinTech, RegTech, and InsurTech startups. This program is designed for startups more mature than those in the parent program. Participants have already raised capital and have some traction with their products. MassChallenge FinTech kicked off its first cohort on a brisk Friday in Boston’s Seaport district this January. Over the coming months, MassChallenge FinTech, with support from FinTech Sandbox, will promote direct collaboration between industry-leading institutions and selected FinTech startups through a comprehensive 6-month program. As these FinTech startups collaborate with their partners to address industry-wide pain points, they will engage in unique programming enabling them to be “enterprise-ready” and drive meaningful engagements with their partners. 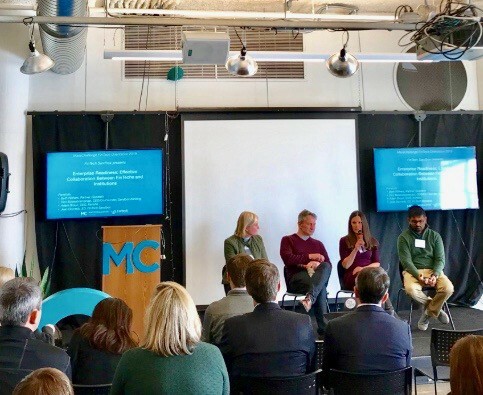 MassChallenge FinTech and FinTech Sandbox have collaborated to create programming consisting of panels, roundtables, and discussion forums bringing in experts in proofs of concept (“PoCs”), enterprise sales, contracting and negotiations, and more. MassChallenge FinTech also supports startups with an extensive global mentor network. Program Director Devon Sherman opened orientation alongside MassChallenge co-founder John Harthorne by welcoming the twenty-one teams that had made it through the rigorous selection process. Next up, Sandbox Executive Director Jean Donnelly and Head of Partnerships Mike DeAngelis gave an overview of the data and resources made available from FinTech Sandbox’s Data Access Program. The FinTech Sandbox team then kicked-off the enterprise-readiness program, introducing the upcoming curriculum to the startups. Next, a conversation with Sarah Biller, Co-Founder of FinTech Sandbox and Founding Advisor to MCFT, and Toast’s President and Co-Founder Aman Narang, followed by a talk by Flywire’s CEO Mike Massaro. Toast and Flywire are Boston-based FinTechs with elegant revenue models and each raised more than $100 million in venture capital last year. Each executive offered a frank discussion of the challenges of scaling a B2B FinTech firm. After lunch, Jean Donnelly returned to the stage to moderate a panel consisting of Beth Withers, Partner with Goodwin Proctor, Adam Broun, CEO of Kensho Technologies, and Ravi Balasubramanian, CEO of Sandbox Banking on the importance of aligning interests before embarking on a PoC. Adam made the point that, as an entrepreneur, time is your scarcest resource. If you’ve been asked to work on a PoC, carefully evaluate why you’re investing your time if you’re not getting paid. Not every deal is worth doing. You want a high degree of certainty that an engagement will lead to a purchase. Structuring your contracts so that your proofs of concept automatically roll into revenue allows you to see who is serious and who may be wasting your time. Beth mentioned another important contact consideration: watch out for IP ownership issues on custom work done as part of a PoC, especially if you plan to incorporate that work into the product going forward. · Find multiple advocates for your success within the incumbent and look for the incentives they may have to see you succeed. · Understand the culture of your partner. Is it truly collaborative (good) or is it every person for themselves (not so good)? · Banker and insurance executives don’t need your product or service. They’ll be just as happy next year without you. So, think like a marketer of luxury goods. Can you create the perception of scarcity, or evoke a fear of missing out? There was palpable excitement among the startups over their ability to work so closely with incumbents on strategically important challenges and a room buzzing with discussions about data. All things product development and data in finance. Powered by FinTech Sandbox, Boston based non-profit breaking down barriers to entry for FinTech entrepreneurs by providing free access to quality data.